The eco beauty community has been buzzing about Max and Me for the past year and for a reason. They're a relatively new brand with a beautifully curated line, holistic approach to beauty and exquisite packaging. Can we take a moment and admire the illustrations? Today's product, the Enchanted face oil, won the title of the best beauty oil in the Indie Beauty Expo in 2016. Little by little, Max and Me products have been increasing in my cabinets as well..
Max and Me is an artisanal skincare brand based in Vienna, Austria. Born from the love story of the two founders Max and 'me' aka Tanja, they seek to create skincare beyond product performance with carefully high vibrational ingredients. Their view is deeply holistic, culminating on healing aspects of plants. All of their products are hand-blended with care in small batches. 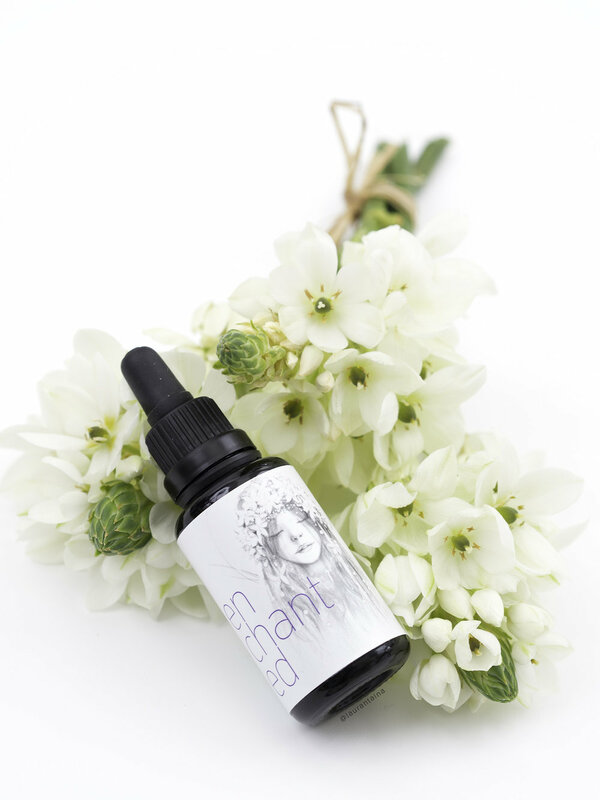 Enchanted facial oil retails 110€ for 30ml, see the stockists here (USA and International are available). In Finland you can get Max&Me from Naturelle. With little understanding about energetic healing and vibrations, please notice my words come from a place of respect. It's difficult to type a paragraph without sounding cynic or arrogant when I simply lack the knowledge about these things. I was first very sceptic when it came to the spiritual side of these products, for me personally the 'elven magic' was just smart branding. The website, packaging and copywriting are so well curated I can't stop observing from my designer's point of view. It is a lovely idea that skincare would be healing and nurturing for both body and soul, but to me skincare is "just" skincare. I don't believe you need a certain products to perform beauty rituals, relax or reconnect with yourself. Could be I'm missing something? However, what I can sense is when something is made with the uttermost care and love - and that's Max and Me. If the intro doesn't get you in the mood for some fairy energy, the packaging will. I'm smitten with the illustrations and typography, they perfectly tie together the mood of the products. Airy, natural, magical. All Max and Me items come packaged in gorgeous white cardboard tubes with a little pamphlet of instructions. They use dark violet glass bottles (similar to miron glass), excellent to protect precious oils from external influencers like sunlight. Enchanted oil has a dropper pipette, which is good for measuring out small amounts of product, but for such an expensive and potent oil I'd prefer an airless pump. Perhaps it's harder to execute as you only need ~4 drops at once. I take about 3-4 drops of the oil, lightly massage my hands together and bring them to my nose, inhale the scent and gently massage and press the oil into my skin. I admit I sometimes can't be bothered and just slather the oil on my face, but I feel this method doesn't do the justice to Enchanted. This oil is meant to not only nourish the skin, but balance and pamper the senses. Although I've used Enchanted for a good couple of months its beauty gets me every time: the light heavenly scent, the luxurious golden color, its instant nourishment. I wouldn't necessarily call the texture of this oil light, but a very small amount spreads evenly on the skin, absorbing without leaving a greasy film. For my dry skin I find it perfect to use both day and night. I've had no problem to top it with a moisturizer, sunscreen and wear under make up. My skin feels very nourished, balanced and pampered. Normally I wouldn't give a full paragraph to the scent of a product, but I couldn't stop typing. The scent is divine: subtle, complex yet harmonious. I've noticed the scents playing a crucial part in all Max and Me products that I've tried. The scent is definitely present, but doesn't burst with sharpness of essential oils or linger around. If I had judged Enchanted just by reading the ingredients list I wouldn't have picked it up: rose and lavender are not my top favorite scents when it comes to beauty products, in fact, I'd run to the opposite direction. But Max and Me scents are unlike in traditional beauty products. They don't smell overpowering, sharp or synthetic - they're far from artificial fragrances and remind me of actual flowers. Think about stepping into a room with a bouquet of flowers - you'll smell its subtle beauty, but get used to it after a while. The scent profile of Enchanted is like a beautiful composition or a painting where each element compliments each other. My nose isn't educated enough I could individually notice the essential oils or extracts, but I've noticed I'm very drawn to ylang-ylang. There's also jasmine, damask rose and English lavender with sandalwood, frangipani and champaca flower. As I don't know much about the energetic talents of essential oils, I'm listing their page for more reference. I can say little about the vibrational characteristics of the ingredients, but according to Max and Me their carrier oils are cold-pressed and carefully selected according to their organic or wild-crafted quality. If you're curious to see which ingredients are organic and which wild-crafted, you can check it on their website. The carrier oils include Moroccan argan oil, South African marula oil, Chilean rosehip oil, Pomegranate oil, Macadamia nut oil and Evening Primrose oil. I have absolutely nothing bad to say about the choice of these oils: they're packed with antioxidants, moisturising, and soothing properties. These oils rejuvenate and soften the appearance of fine lines, improve skin elasticity and antioxidants help to protect and repair free radical damage. I especially love marula oil as it's intensively moisturising and nourishing for dry skin. Rosehip oil is full of vitamins and essential fatty acids, and it's primary benefits is to correct dark spots, reduce the appearance of scars and fine lines as well soothe dry, itchy skin. Argan oil has excellent skin rejuvenating effects, it's even said to help in prevention and appearance of cellulite and stretch marks. With the combination of pomegranate seed, macadamia nut and evening primrose oil Enchanted is a beautiful, effective and all-in-all nourishing cocktail. The rest of the ingredients, like benzyl alcohol, benzyl benzoate, linalool etc. are ingredients of the essential oils. Tocopherol is an ingredient of the evening primrose oil. What I researched on EWG's Skin Deep, I'm a bit concern about some of the last ingredients such as citral and isoeugenol as they may be possible irritants and allergens. Then again, they're at the very bottom of the ingredients list listed as ingredients of the essential oils, so I wouldn't be too worried except if you know you're very sensitive to essential oils. Then you should approach this product with caution anyway. Personally I've had nothing but joy using this oil. Enchanted is worth of its name, as it's one of most memorable facial oils I've ever tried. Where as the Josh Rosebrook serum (review here) left and instant glow on my skin, Enchanted feels nourishing on a deeper level. It also has the holistic aspect of relaxing and nurturing. 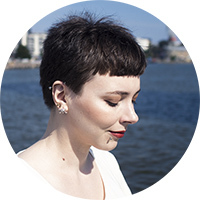 I don't know much about energetic talents, elfin light or vibrations - it was pretty much nonsense to me when I was first introduced to the brand, but I think Max and Me has made me open my heart to a new world in holistic skincare. I can agree what Max and Me has said about the energetic talents of ylang-ylang: there is a deep relaxation, harmony that resonates with my intuition and creativity when I inhale the essential oils and perform my own little skincare ritual. If the skincare benefits of the Enchanted facial oil were't beyond excellent I doubt I would reach for it, but any additional pampering? I'll take it. Have you tried Max and Me yet?